I was making a new car when I happened upon a dilemma. The car in question was moderately fast sports car. This sports car also had a four seats. As far as I'm aware you can not add seats/slots for Sims just willie nillie. As I found out, it is controlled in the script class, or the code that tells the object and game what it is and what it does. 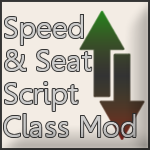 This mod adds 11 new car script classes to make any individual vehicle faster or slower with more or fewer seat slots. This is a realism mod, which means it just makes things seem better. An example of use would be if you had small Four door family sedan with a speed of 8. Most likely, that car was cloned from the sports car; meaning it only has two seat slots, even though it's a four door. Changing the script, you can slow it down to Mom speed and give her kids a place to park themselves. Anyone. As a Game player, change the way your Non-EA cars work. As a creator, enjoy the freedom to make a car with proper speed and seating arrangements. If you do not know where to put this file after downloading or find Copy and Pasting a "Tedious computer task" you most likely should not use this. You will benefit greatly from prior knowledge of S3PE. As a Game Player, this requires you to alter the OBJK in the intended car's file using S3PE. Using S3PE, acquired Here, open your car package. Towards the top you will see a box that contains "Sims3.Gameplay.Objects.Vehicles. [variable]"
As a Creator, this requires you to alter the OBJK in the intended car's file using S3PE or TSRW. Using S3PE, open your car package. Using TSRW, open your work file. In the menu select "Edit > Project Contents"
Replace the current one with one from below. Place this .package in your Mods folder and enjoy. In game, modified cars may not reflect the speed change in the catalog; but the change is there, and depending blatantly obvious. Base Game version 1.17.6 or higher is required for proper use.